On Dec 05, 2018, Congruent celebrated its annual day ‘Spectra 2018’. The active participation from each employee had brought lot of joy and made this event full of colours & fun. Congruent successfully developed and modernized the intranet portal for an US government agency. We re-branded the customer’s intranet portal by developing new department specific portal home page and related contents. Also Enhanced their current search setup in SharePoint and improvised governance policies to access data in SharePoint. We are delighted to announce our recent partnership with a leading product development company in Pennsylvania. The customer provides products and services around business intelligence & analytics and we have been helping them with their development needs around Microsoft Business Intelligence. One of our recent customer acquisitions is a leading hospitality company and we are helping them with SharePoint Portal development for better collaboration. Microsoft announces New Dynamics SL 2018! Microsoft has unveiled Dynamics SL 2018 for direct download from Customer Source and Partner Source. Microsoft has also revealed, Dynamics SL Directory which contains information on Dynamics SL 2011, Dynamics SL 2015 and Dynamics SL 2018 respectively. Congruent setup the SharePoint environment for 200+ corporate users and 5000+ doctors across 85 locations. We performed data migration services for the customer, moving data from a different content management platform into SharePoint successfully. Configured and developed effective workflows for smooth working of various business process. Congruent is happy to introduce Memories, a free to use, intuitive app, that lets you create beautiful photo albums in just a few clicks. From time to time, Congruent has always been expanding its service portfolio by adding new technologies & competencies under its belt. It is a moment of joy as we have developed competencies on Dynamics 365, and successfully delivered services on the same to our clients. Microsoft has announced the general availability of Dynamics 365 globally. Click here to learn more about this cloud-based suite of purpose-built, intelligent business applications. Microsoft Dynamics SL 2015 CU2 is expected to be released worldwide in Q4 of calendar year 2016 with Web Apps enhancements and Power BI integration. Congruent is excited to take part in London Technology Week 2016. We would be present in various events spanning from 20 June to 22 June. Microsoft has released one of its most awaited financial software, Dynamics GP 2016 on 1st May, 2016. The product is Cloud/Mobile ready as Microsoft focuses more towards cloud computing with its new releases. Apart from the cloud ready, the new HTML5 web clients looks promising to improve the product's performance. Congruent is thrilled to announce that it is an exhibitor at Indo-Africa ICT Expo 2015, Nairobi, Kenya. Visit us at our booth #41 to discuss how our services can help you in your business. Microsoft and Adobe recently announced a strategic partnership at the Adobe Summit that will see the integration of Dynamics CRM and Dynamics Marketing with Adobe’s Marketing Cloud Solutions. This partnership will redefine the way enterprises manage their marketing, sales and services to enhance customer engagement. Microsoft is scheduled to release a new web app - Microsoft Dynamics SL 2015 CU1, in the second quarter of 2015. Microsoft announced that it has acquired Datazen, a mobile business intelligence and data visualization service. Congruent was an exhibitor at PASS Summit 2014, Seattle. The event had various interesting sessions and technical workshops that were beneficial for technical specialists. It gave us immense pleasure to be able to interact with many attendees who visited our booth to discuss about our services like Microsoft BI, SharePoint, Dynamics ERP & CRM and Mobile. Congruent is thrilled to announce that it is an exhibitor at PASS Summit 2014, Seattle, WA. Visit us at our booth #238 to discuss your requirements on Microsoft BI and other Microsoft technology based products & services like Custom Application Development, SharePoint, Mobile, Dynamics ERP & CRM. 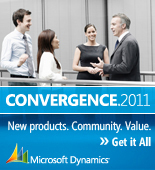 Congruent is an exhibitor at Microsoft Dynamics Convergence 2014 for the second consecutive year. Visit us at our booth #442 for any development needs on Microsoft Dynamics ERP & CRM, Mobile, SharePoint, Microsoft BI & .Net. Continuing the tradition of supporting social causes, this Children’s Day, Congruent extended its aiding hands in the form of charity to the children of an orphanage. Keeping in line with the practice of participating in various events & workshop, the testers from Congruent recently attended a workshop on Mobile App Testing. Congruent is an exhibitor at Convergence 2013, New Orleans, LA. Connect with us at booth #2150. Congruent is all set to celebrate its Annual Day event ‘Spectra 2013’, which is scheduled on 25th of January 2013. Congruent has completed EDI implementation in Dynamics SL. Congruent has completed a major Dynamics SL 2011 upgrade for a South East Asian public ltd. Company. Shopping cart application for iPad. Congruent has completed a shopping cart application for iPad, which is exclusive to duty free shops in airports. Congruent has successfully completed testing of a Windows based .NET application. Congruent’s Testing Team has successfully completed the testing of a Windows based .NET application for a North American customer. The application provides details of the latest deals around the location. The team tested the installation, uninstallation, upgrade, functionality, compatibility with browsers and operating systems and the performance of the application in various operating systems. Congruent is customizing a .NET based smart client application to calculate pre-tax employee benefits. Congruent is customizing a .NET based smart client application to calculate pre-tax employee benefits. The product maintains online enrollment details, online claims, account details, money transactions and various reports for the customer and their clients. Congruent has recently completed an Exchange 2010 web service integration project for one of its clients in Europe. Congruent has completed a new implementation in Dynamics SL 2011 for one of its client based in South Asia. MercuryBI has been integrated with MS Dynamics GP, now users can have automated operations. Rajesh M. Asher (Business Development Manager) is representing Congruent at MICROSOFT DYNAMICS CONVERGENCE 2011 at Georgia World Congress Center - Atlanta, Georgia. Congruent have successfully implemented MSCRM through onshore and offshore service model for a state government agency in Washington, USA. This implementation establishes an enterprise and scalable application that supports consolidation of data stored in different systems. Implementing CRM helped the agency to streamline their vital operation of serving document to parties and effectively manage them. Mani Krishnamurthy (President) and Robin Wesley Kulasekararaj (Practice Head - DW & BI) representing Congruent at the Microsoft Worldwide Partner Conference (WPC) at the Walter E. Washington Convention Center in Washington D.C. on July 11-15, 2010. This five-day partner event is an annual gathering for the Microsoft partner community to learn about Microsoft’s roadmap for the upcoming year, network and build connections, share best practices, experience the latest product innovations, learn new skills, techniques and to explore infinite opportunities. Mani Krishnamurthy ( President ) and Rajesh M. Asher ( Business Development Manager ) represented Congruent at the IOF 2010. The 7th year meet up of the IOF – International Outsourcing Forum 2010 is happening in London from February 11th to February 14th at Hilton Metropole. IOF 2010 is intended for senior executives with active outsourcing requirements to meet with major outsourcing Supplier organizations and IPAs (investment promotion agencies) from all over the world through a series of specific, tailored, one to one business meetings. Running alongside these business meetings will be a programme of interactive presentations, workshops and seminars designed to help tackle the challenges emerging in the industry. Congruent signs an agreement to implement Microsoft Dynamics Navision (Microsoft Dynamics NAV) for a leading MNC in South India. Bullish on BI - Robin Wesley (Practice Head DW/BI Congruent) featured in Express Computer Journal.